Learn Spanish in Bocas del Toro, Panama's #1 Beach Town! 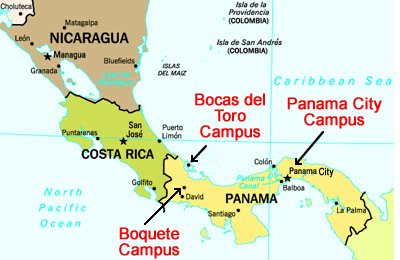 Location: where is Bocas del Toro within Panama and how to get here? Attractions & 19 Things to Do: from surfing and sea kayaking to scuba diving and fishing, you'll certainly fall in love with Bocas' warm, turquoise and crystal clear waters. Weather: how's the climate like in Bocas del Toro? When does it rain and when is a good time to visit? The Archipelago of Bocas del Toro: discover Bocas del Toro's islands - Isla Colon, Bastimentos, Carenero, San Cristobal, Solarte, Zapatillas, Cayo de Agua, Popa. Hotels, Restaurants & Nightlife: where to stay, where to eat and where to party? People, History, Facts: get to know the real Bocas! Habla Ya Bocas del Toro is accredited by the Instituto Cervantes, the worldwide authority for teaching Spanish as a foreign language. Habla Ya Boquete is also an Official DELE Examination Center. What's it like to learn Spanish in Bocas del Toro? The paradisaical islands of Bocas del Toro, Panama's top beach destination, are located in the country's northwestern Caribbean Sea. The archipelago separates Bahia Almirante (Almirante Bay) and Laguna de Chiriqui from the open Caribbean Sea. Situated near the Costa Rican border, captivating Bocas Town, home to 8,000 inhabitants, is situated in the south eastern tip of Isla Colon, the Archipelago's main island and epicenter of activity. Bocas del Toro is easily accessed by air through daily 45 minute flights from Panama City or a 3 hour drive and 30 minute boat ride from Boquete, where our first Spanish school is located. The domestic airlines who offer these flights are Air Panama. When planning to study Spanish at any of our Spanish schools (or at several of them! ), we will help you make these flight arrangements at no extra cost. During the weekends we also provide a shuttle service between our schools in Boquete and Bocas. 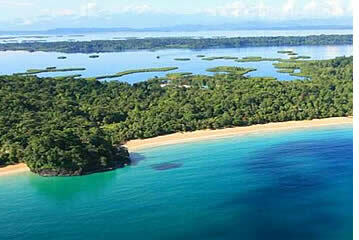 The Archipelago of Bocas del Toro offers visitors endless opportunities in terms of beaches and water sports. Secluded golden and white sand beaches and emerald waters await you.... with kilometers and kilometers of uninhabited coasts it won't be difficult at all to find the perfect stretch of beach for you. Uncrowded waves, colorful coral reefs, abundant marine life (dolphins, turtles, tropical fish, manatees) and a vibrant island nightlife, Bocas del Toro is truly a Caribbean Shangri-la. If you're a beach lover, you'll love Bocas! With so many beaches to choose from, you can literally go to a different beach every day during your vacation in Bocas del Toro! 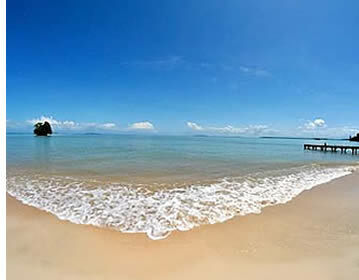 The Archipelago of Bocas del Toro is replete with white and golden sand beaches. Many of them are safe and protected from currents year round, while others are more exposed to the surf when the swell is up. On Isla Colon you'll find the following beaches: Playa El Istmito, Big Creek, Playa Mango, Paunch, Flat Rock, Bluff Beach, Starfish Beach in Bocas del Drago, La Piscina, Playa Lagarto and Mimitimbi Beach amongst others. On Carenero, the neighboring island of Isla Colon, you'll also find several white sand beaches and on Bastimentos Island you'll be able to enjoy Playa Primera (Wizard Beach), Playa Segunda, Red Frog Beach, Playa Polo and Playa Larga (Long Beach). On the east of Bastimentos there are more unnamed beaches and all the rest of the islands (Solarte, Cristobal, Popa, Cayo de Agua) have their fair amount of amazing beaches. Some of the most spectacular beaches can be found in the Zapatillas Cays and in Escudo de Veraguas. With a consistent seasonal swell (December - March, June and July), Bocas del Toro offers visitors uncrowded, quality waves and a tropical surfing experience in Panama's warm Caribbean waters. In Bocas you can find exciting reef and beach breaks. The islands offer mainly lefts and some right handers. Taxi boats will drop you off in the line-up of your favorite spot. There are waves for all levels: from beginners to pro. When the surf is "on" you can expect powerful hollow waves and plenty of tubes. For beginners there are mellow reef and beach breaks to enjoy too. Many surfers come and learn Spanish in Bocas del Toro because of its surf. Be respectful, don't arrive in large groups and let your surfing do the talk. In several quality breaks you'll find some localism (remember, it's not your wave), which you can avoid if you surf early (yes, people party hard in Bocas). If you're learning or want to learn to surf, we'll put you in contact with the most knowledgeable surf schools who will take care of you and take you to the best spots for learning (wave wise and crowd wise). Or of you're an intermediate, advanced or pro surfer, and would like to hit the more challenging breaks, we can also arrange a surfing guide or outfitter adequate to your level of skills and experience. Be it on the ocean or within the island's jungles, in Bocas del Toro you can easily have close encounters with the most beautiful species in the wild, such as manatees, dolphins, sloths, howler monkeys, rays, toucans, snakes, caimans, sea turtles (not only in the water, but also nesting or hatching in Bluff or Bastimentos), reef sharks and obviously an innumerable amount of birds, tropical fish and other sea creatures. Come to Bocas and experience Panama's wildlife at its best! Located on Bastimentos Island, the Red Frog Sky Zipline Canopy Tour offers visitors a much more intense and complete experience than most zipline canopy tours in Central America. If you've ziplined in Mexico or Costa Rica before and think you've done it all, think again and don't miss this amazing island zipline canopy tour. Besides being able to experience 7 ziplines way up in the rainforest with stunning views of the surrounding sea, you'll be challenged by a Tarzan Swing and Traversable Canopy Net, a Treetop Challenge Course, a Swaying Sky Bridge and a Vertical Rappel. And if you're lucky enough you might also get to see some red frogs and sloths. In Bocas del Toro you'll be able to find almost every single known type of coral in the Caribbean and an immense variety of tropical fish and sea life. Bocas del Toro is a great place for beginning divers and snorkelers due to its calm, accessible waters with plenty of coral and sponge gardens to explore at shallow depths such as Crawl Cay, The Whorehouse, Buoy Line, Coral Garden, The Wreck, Marker 19, Playground and Hospital Point. There is also more challenging cave, wall and wreck diving for experienced scuba divers such as Manuel's Wall, Tiger Rock, The Zapatillas, Shashe and Wash Rock. Other dive sites, which are more exposed to currents and swell, vary in difficulty depending on the time of the year such as Polo Beach, Dolphin Rock and the Paunch area. Obtaining your PADI certifications can easily be arranged and Bocas is one of the cheapest places in Central America to do so. If you'd just like to snorkel you can obviously bring your own mask and go on a boat tour to many snorkeling spots, or you can also rent or purchase snorkeling gear in town. You'll enjoy the best visibility during the drier months (February, March, August, September and October), though snorkelers and divers will always be rewarded year-round with warm waters and abundant ocean life. As many rivers empty into the sea here, aim to go when it hasn't rained for several days. On good days the visibility can reach 25 meters, and less than 3 meters when it has been raining a lot. The more adventurous can rent a sea kayak, a stand up paddle board or go on a guided tour, and navigate to secluded beaches or find their own snorkeling spot. Sea kayaking and SUP are great ways to work out and explore the islands of Bocas on your own. If you want to get close and personal with the inner secrets of each island, nothing beats a good hike through them or along their coasts. In Bastimentos you can start a good hike in Old Bank, pass by an organic farm Up in the Hill and reach Wizard Beach. If you're fit enough you can even continue to Red Frog Beach. Also on Bastimentos you can start several hikes through the jungle from Salt Creek: a bat's cave, Long Beach, Playa Pelicano or Sendero Caiman, you choose! 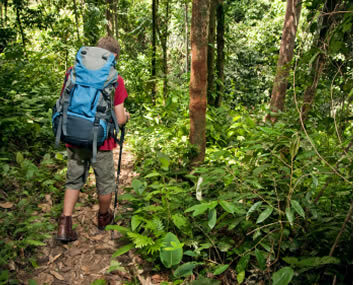 On Isla Colon there are several trails within the island's jungles and many travelers favor hiking from Bluff Beach all the way to Boca del Drago. 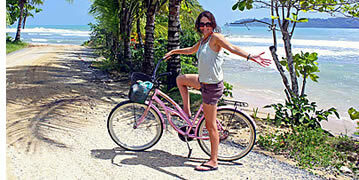 As in many Caribbean islands, bicycles are a major form of transportation in Bocas del Toro. On Isla Colon you can't miss a cycle from town to Bluff Beach or if you'd like a bit more of a challenge, cycle all the way and back to Boca del Drago (or even around the entire island). Bicycles can be purchased or rented by the day or the week on the island so that you can easily get around town. 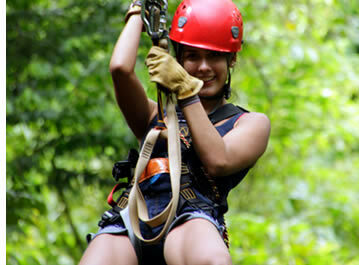 In Bocas del Toro's jungles and coasts you'll be able to easily encounter many different birds. All you need is a good birding book or a knowledgeable guide and off you go. Some of our favorites sightings include Toucans, Oropendolas and different types of parrots. Swans' Cay, also known as Bird Island is a birder's paradise. 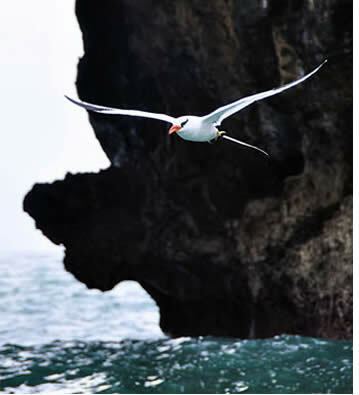 Here you'll find the only known nesting place in the Caribbean of the Red-billed Tropic Bird (Phaeton aethereus). Swan's Cay is a rocky formation approximately 70 meters long, with a rounded quarter moon shape, pierced by two openings through one end, and rises 55 meters at the highest point. On the southern side, sheltered from the northeastern trade winds, there is a small sandy beach below a higher level area. Bushes and other vegetation cover the summit, and there is a small clump of coconut palms at the low end. A designated bird sanctuary, Isla Pajaros, also has brown booby (Sula leucogaster etesiaca), the brown pelican (Pelecanus occidentalis carolinensis), the frigate (Fregata magnificens) and many types of gulls and terns. 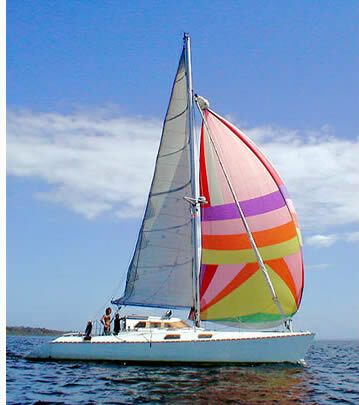 If you'd like to tour Bocas del Toro by sailboat, it's also an option. Tourists normally cruise to Dolphin Bay, Crawl Cay and other popular places by covered pangas, but you can also choose to do the same but in style by sailing in a catamaran. As with other waters sports, fishing in Bocas del Toro can truly be world class if you hit the right season. From March through early May, and then late July through mid November, the water is clearer and the fish migrate to Bocas looking for the abundant bait fish. You can fish near shore fish for Tuna, Wahoo, Grouper, King Fish, Snapper and Barrucuda, or head toward river mouths and lagoons in search of Tarpon, Snook or Jack. You can spearfish and catch lobster as well. If you'd like to offshore fish, within 10 miles of Bastimentos island, you'll already be hitting the 9,000 feet depth marker and it does not take long to get to the billfish (although less abundant than in Panama's Pacific). We will happily arrange a fishing charter for you whether you'd like to nearshore fish or go deep sea fishing. Instead of cycling, another way to get to know Bluff Beach is by horseback, which certainly provides you with a really nice way to get to know the coasts of Isla Colon. On Cristobal Island, horseback riding tours can also be arranged. When there is no surf, head towards the protected waters of our mangrove islands and take advantage of Bocas del Toro's sheet glass conditions 365 days a year. Bocas del Toro offers visitors great wakeboarding and water skiing conditions. Jump start your day with yoga classes in Bocas del Toro. Daily yoga classes are organized by different members of our community. Yoga classes in Bocas del Toro take place at the Bocas Yoga Studio with Laura Kay and at the Energy Club next to the Main Park. After days full of surfing, diving or simply beach relaxation, splurge on a wonderful meal and then get your groove on a go out to party hard, Caribbean style! In Bocas del Toro you'll find an international cuisine with plenty of fresh yummy seafood. And when it comes to partying, nightlife in Bocas del Toro is epic! With a chilled out Caribbean vibe, nightlife in Bocas del Toro offers visitors an authentic taste of what it's like to party by the beach. There are several bat caves around the Bocas del Toro Archipelago, but one of the most interesting ones is located in the Bastimentos National Marine Park. To get there you'll go up a small creek in a cayuco and once you reach it you'll find a cave full of bats with wonderful rock formations. To reach the other side and get into the cayuco again you'll have to go through chest high water. At Colon Island in Panama's Bocas del Toro region in the Caribbean, STRI has established a site for education and research, providing scientists and students with access to an extraordinary diversity of marine and terrestrial biota. This station is situated among areas of undisturbed forest, a remarkable coastal lagoon system, and numerous islands and reefs. As if the beauty offered by Bocas del Toro's islands wasn't enough, you can also visit spectacular gardens and butterfly farms. Learn how the ngobe indigenous grow cacao to produce chocolate. On the other hand, there are many other things that you can do in Bocas del Toro without spending that much. Checkout this Blog post about 10 Things to do in Bocas del Toro for less than $20. Although Bocas del Toro is Panama's most popular beach destination, it still remains virtually uncrowded when compared to similar towns in Costa Rica or Mexico. 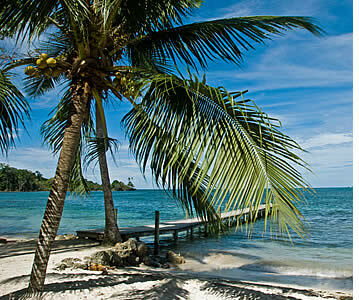 In Bocas del Toro you'll be able to learn Spanish and live an unforgettable beach vacation in Panama's Caribbean. 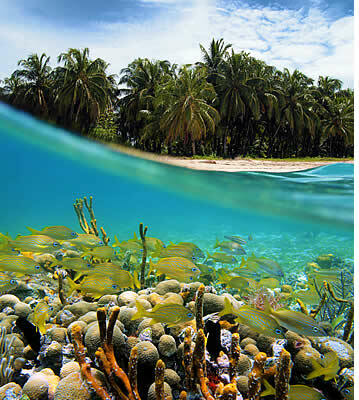 Bocas del Toro enjoys a tropical rainforest climate with temperatures ranging from 70Â° to 90Â° F (20Â° - 32Â° C). Being situated below 10 degrees north latitude, Bocas del Toro is completely a hurricane free zone and is visited by vacationers all year round. Rain tends to be more frequent late at night and early in the mornings, with clear blue skies and sunshine during the rest of the day and early in the evenings. In average, there will be some rain on 50% of the days of any given month (we are in the tropics!) and from time to we do experience heavy downpours just as any island in the Caribbean. This doesn't mean that when it rains you can't enjoy the outdoors because there will be parts of almost every day when it's not raining. In other words, children won't become crazy and adults won't become cranky because of the rain during their vacation time in Bocas del Toro. Bocas del Toro receives an average rainfall of over 3,000 mm (130 inches) of precipitation each year. The driest months tend to be January, March, May, September and October. It is very rare that rain will keep you from going out all day long, and even less frequent that this could happen for several days in a row. When it does, it normally means there is a hurricane going on in the Caribbean up north and Bocas del Toro will ONLY get some heavy rain but NO HURRICANES at all. It also generally means that we're enjoying really good surf! For more info you can check out this post about if it will rain during your vacation in Bocas del Toro... (spoiler alert: no one really knows). The above table represents our usual weather patterns, but with the world's current climate change it's difficult to predict what will happen on any give day. During the last 3 years for example, June, July and August, which tend to be wetter months, have been particularly dry. On the other hand, some of the best surfing is to be had on rainy days or when it's cloudy (it's wind swell after all). Even if it's raining, with Bocas del Toro's warm Caribbean temperatures, you shouldn't be stopped from enjoying the outdoors and as mentioned above, most of the time there will be parts of the day when it's not raining. Even though Bocas del Toro can be hot and humid you shouldn't be worried when it comes to Spanish learning because your Spanish lessons will take place in air conditioned classrooms. The beautiful people make their way through Bocas del Toro's streets in flip flops, bikinis and board shorts, which will be your normal and daily attire and will help you keep fresh enough. And there is always a beach close by and chilled coconut water to keep you cool and enjoying the sun. When packing for your Bocas del Toro vacation, don't forget light cotton clothes, plenty of swim wear and a good rain jacket. And once in Bocas, if a day starts a bit cloudy or rainy, no need to worry: it's very probable that the wind from the north will blow the clouds away and the sun will come out! And if it does rain all day long, appreciate it and be thankful: we have an incredible amount of lush vegetation in Panama due to this rainfall. It is because of the rain that we have all of the diversity of plant and animal life. 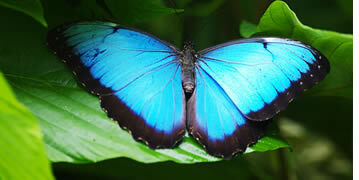 We have to respect the rainforest as so many things are still undiscovered here. The Bocas del Toro Archipelago is a scattering of 7 major islands and more than 52 cays and 200 islets off the northwestern coast of Panama. The region has all the elements you could dream of in a Caribbean fantasy: postcard perfect white and golden sand beaches lined up with coconuts and palm trees, thatched-roofed huts, emerald waters treasured with with abundant sea-life, a thick tropical rainforest, seasonal consistent-quality surf breaks and a soft ocean breeze. Add to that a funky, laid and chilled back vibe, and a friendly local population, and it's easy to see why Bocas del Toro is quickly emerging as an eco-tourism/beach hot spot faster than any other part of Panama. It's the main island of the region, 62 sq. km (24 sq. miles) and home to Bocas Town on its south-eastern tip, the regional capital and the epicenter of activity in the archipelago. Most of the archipelago's hotels, restaurants, tour outfitters and services are in Bocas Town which can be walked from tip to tip in about 25 minutes. Most of Bocas Town's activity is concentrated on both sides of Calle 3ra and Avenida G. The busiest section extends from the town plaza, Parque BolÃ­var, down to the ferry pier. The area west of Calle 3 is mainly residential, as is the section on the northwest waterfront. A road leads north out of town, past the fairgrounds, where the annual Feria Internacional del Mar is held, and over an isthmus. The road forks north of town. The east fork heads up the east coast of the main island, becoming increasingly rough but leading to the island's best beaches such as Big Creek, Flat Rock and Bluff, which is an important turtle nesting area, and surf breaks such as Tiger Tail, Paunch and Dumpers. The west fork leads to a road that cuts diagonally across the island, passing La Gruta, a cave popular with those into bats. The road dead-ends at Boca del Drago, on the north-west of the island, about 14 kms away from Bocas Town. Boca del Drago is a a little beach area on the northwest side of the island and home to Starfish Beach. All the rest of the island is covered with thick jungle and tropical rainforest, and most of the rest of its coasts are surrounded by beautiful sandy beaches. Nature lovers' paradise is 52 sq. km (20 sq. miles) large, and the mid-section of the island and some of its surrounding waters are even part of the Bastimentos National Marine Park. The north shore of Bastimentos is exposed to the surf and offers visitors miles and miles of stunning white and golden sand beaches such as Playa Primera or Wizard Beach, Playa Segunda, Red Frog Beach, Polo Beach and Long Beach or Playa Larga. This last beach attracts various species of sea turtles in the nesting season and due to its remoteness is only fully enjoyed by a handful of privileged local surfers and very few visitors. It is truly world class. Cayo Crawl is at the southern tip, separated by a shallow channel from Isla Popa. The protected waters on the southeast side of the island, between Crawl Cay (Cayo Coral) and Punta Vieja (Old Point), are shallow and glassy, making it perfect for underwater exploration of coral playgrounds and sponges, and from here you have access to the Zapatillas Cays. The southwest is blessed with mangrove islands of extraordinary beauty and Bastimentos itself is home to a dense tropical rainforest with many exotic and endangered species, including the famous red poison-dart frog (Oophaga pumilio). A little bit over a thousand inhabitants populate Bastimentos Island most of which are concentrated in the largely Afro-Caribbean town of Old Bank on its western tip, only a 10 minute boat ride from Bocas Town on Isla Colon. Quebrada de Sal or Salt Creek, on the south east is another significant population and both are worth visiting to get to flavour the local culture. Isla Colon's neighboring island is only a 2 minute boat ride away. It's a tranquil location if you'd like a quieter setup than Bocas Town but still close enough to where everything happens. The west side of the island facing Isla ColÃ³n is rather densely populated, with lots of basic houses squeezed next to each other on the waterfront and unfortunately it's not the cleanest place in Bocas. The east side of Carenero that faces Bastimentos is more deserted but certainly a lot nicer: a couple of small hotels, restaurants and a bit of beach. The north side of the island has one of the best waves of the archipelago, a long, barreling reef break. A 5 minute boat trip from Isla Colon, Isla Solarte or Nancy's Cay, is an 8 sq. km (3 sq. mile) island known for Hospital Point, on its western tip, which lies just across the deep channel to the east of Isla Carenero. Isla Bastimentos protects Isla Solarte from the open Caribbean. Isla CristÃ³bal is a 37 sq. km (14 sq. mile), mostly deforested island south of Isla ColÃ³n. 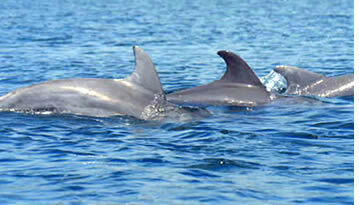 An enclosed bay on the islands south-east waters, known as Laguna Bocatorito, or Dolphin Bay is an important breeding site for the bottlenose dolphin. It is one of Bocas del Toro's most enjoyable attractions because dolphins swim up close to visiting boats and prance about. 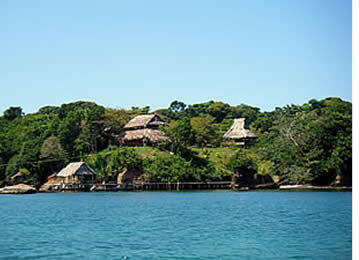 Is the second largest island of the Bocas del Toro Archipelago with 53 sq. km (20 sq. miles) and is home to five indigenous communities. Popa has very few tourists (only a couple boutique resorts) and the indigenous live a pretty basic lifestyle on the island. The main occupation is diving for lobster, fishing and agriculture. They also have a chicken farm for meat and eggs. At one of the communities, Popa 2, you'll be able to find a restaurant and a cabin for lodging. 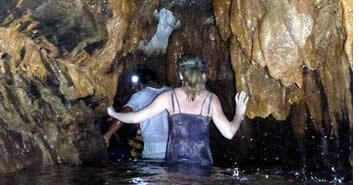 Tourists can buy handicrafts and visits the forest and the mangrove with a native guide. The "Trail of Sandubidi" runs from the community through the rain forest for about 2 kilometers. Along the way you can birdwatch, spot small mammals and find medicinal plants. 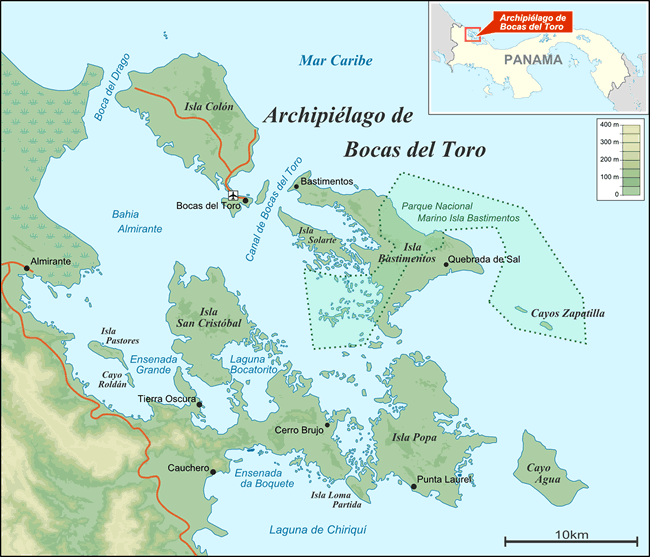 Is the eastern and southernmost island in the Bocas del Toro Archipelago, Panama. It is 16 sq. km (6 sq. miles) and is home to an indigenous village of about 600 inhabitants, which is mainly a fishing community, with some agriculture and cattle. It is certainly a charming village of wooden houses built on stilts over the Caribbean Sea. A walking trail starts at the community and runs northwest along the coast of the island. On the northwest of the island at Punta Limon Beach, there are fossil deposits of coral and clams, which are part of a 3 million year old vein of coast's cliff. Although you'll spend most of your time on Isla Colon, you really can't miss to visit Isla Bastimentos. 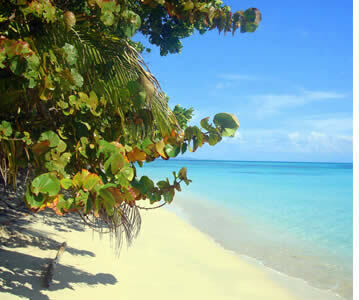 You should even consider spending a weekend or two on Isla Bastimentos during your Spanish language holiday. If you'd like to experience a more tranquil environment, Isla Carenero offers an attractive alternative to Colon Island as it's less developed but still really close to Isla Colon so that you can get to your Spanish classes in time! 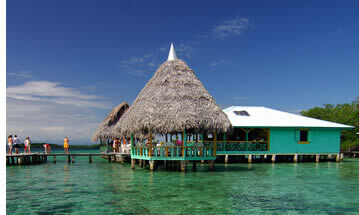 In Bocas del Toro you'll find hotels that will meet any type of budget. You can stay at budget hostels, mid range boutique hotels and bed & breakfasts, or at luxurious oceanfront hotels. If you learn Spanish at our Spanish School in Bocas del Toro you'll have access to very convenient rates as we have negotiated lower rates for our students' extended stays. Travelers can stay in Bocas Town on Isla Colon and be close to restaurants, bars and shops (and our Spanish school of course), or they can also stay outside of town in a more tranquil and quiet setting. Big Creek, the Paunch area, Bluff Beach and Isla Carenero (a 2 minute boat ride from the main island) are all great options for those looking for a more natural environment. During Christmas Holidays, January, February, March, and during the "Feria del Mar" (Fair of the Sea) in September, hotels in Bocas del Toro usually sell out so plan ahead of time to make your reservation. We obviously help our Spanish students make arrangements to stay at the best hotels in Bocas del Toro and we have negotiated special prices for them when they stay for several weeks or months. When it comes to Bocas del Toro's cuisine, thanks to new residents from all over the world, the town of Bocas del Toro has an ample restaurant selection, with such surprising options as Thai, Japanese and Indian cuisine to complement the traditional creole seafood. You can enjoy a local traditional lunch for as little as $3 or you can also splurge at several fancier restaurants. Like everything in Bocas, dining is casual and the pace is slow, so be patient for your meal. Local specialties include lobster, whole-fried snapper, octopus, and shrimp served with patacones (fried plantain slices) or yuca frita (fried cassava strips). Thanks to the region's isolation, Bocas del Toro definitely feels like a totally different country than Panama, to the point that it can be quite difficult to buy any of Panama's local newspapers in Bocas del Toro: it's just that what happens elsewhere in Panama doesn't seem to affect Bocas and viceversa. The Ngobe-Bugle, Panama's largest indigenous group, live in most of the province, both on mainland and throughout the Archipelago. 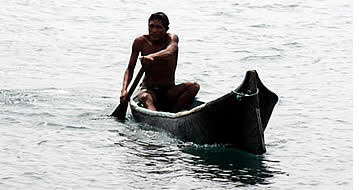 A dugout canoe, called the cayuco, is their most common form and transportation and is also used for fishing. The Ngobe speak their own language which they call "dialecto", as well as Spanish. Many of them have kept alive their ancient customs and form of life: fishing, subsistence farming; gathering medicinal plants from the forests; and producing crafts such as handwoven chacara bags. The Naso, or Teribe, Bocas del Toro's other indigenous group (only 3,500), live on the mainland and have the only surviving monarchy in the Western hemisphere. Without access to running water or electricity, they also speak their own language and Spanish as well. They live in traditional wooden huts on stilts and travel between their villages by river on balsas – small, precarious-looking rafts, which are pushed along by poles. The population of Old Bank on Bastimentos is an interesting mix of descendants from Jamaican and French Antilles' blacks who mainly traveled here to work on the banana plantations. Old Bank is quite laid back and you can almost feel everyone dancing to roots and reggae. 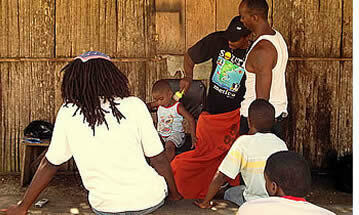 The local creole language – Wari Wari – is a mix of English, Spanish, French and Ngöbe. 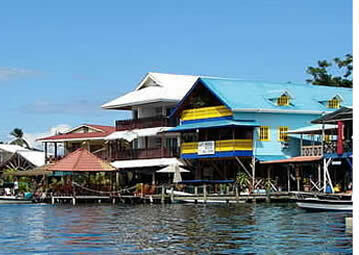 Bocas Town itself is a lively mix of Latinos, Chinese, Ngobes, Blacks and foreign residents. This great cultural influence is reflected in the town's international cuisine, handicrafts sold, in the hotels' architecture and decor, and in all the rhythms found at night. 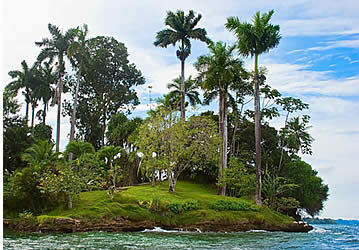 The islands of Bocas del Toro were formed between 1 and 8 million years ago. These islands were separated from the rest of Central America and so plants and fauna evolved that were unique to the region. The archipelago was originally inhabited by native indians with a significant settlement in Boca del Drago around AD 900-1150. On his fourth and last voyage, in 1502, Christopher Columbus ships had been damaged and he found shelter in the waters of Bocas. The islands discovered by Columbus in 1502, became supply and repair stations for shipping. Christopher Columbus was so so taken by the beauty of the area that he affixed his name to many sites, including Isla Colón (Columbus Island), Isla Cristóbal (Christopher Island) and Bahía de Almirante (Admiral's Bay). Other islands have names like "Bastimentos" which in old Spanish means "supplies" and "Carenero" translating to "careening". During the 17th century, the archipelago became a safe haven for pirates. Just as Columbus they repaired their ships on the islands, built others with wood from their forests and fed upon the many sea turtles that nested on the beaches. Legend says that they buried treasure on several islands but to date none has been found (or at least reported!). At the beginning of the 19th century various Scottish and English families came from Jamaica and other British Caribbean possessions, with their slaves, in order to evade taxes. Thousands of slaves from the Colombian islands of San Andrés and Providence were brought as labour by rich landowners. When slavery was abolished in 1850, the slaves stay put and made Bocas their home. The town of Bocas del Toro on Isla Colon was founded in 1826 and it became a banana boomtown a century ago. 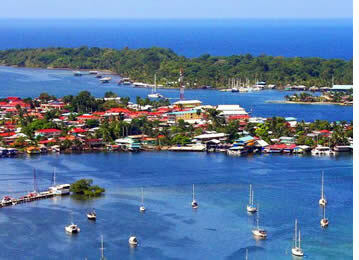 Bocas del Toro was the third most important city of Panama, during the late 19th century and the early 20th century. United Fruit Company, the large banana producer, known for its Chiquita brand, was based here. Vast tracts of land were also turned over for o the cultivation of sugarcane, cocoa, and coconut palms, while the trade in tortoiseshell and live turtles continued. At the height of its prosperity there were five consulates, three newspapers, a bottling plant and the first lottery in Panama. All that ended in the 1920s with the demise of commercial banana production, which was taken to main land, but some of the old colonial buildings and parks from that time still remain. Nowadays, Bocas del Toro's magnificence and natural beauty is being rediscovered all over again by travelers from all over the world. 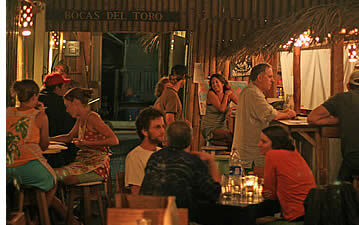 Due to the influence of tourism, many people speak English fluently in Bocas del Toro. And although Panama receives A LOT LESS tourists than countries such as Costa Rica, Mexico or Argentina, don't forget that you're here to learn Spanish: hangout with locals and practice your Spanish! The perfect beach town to learn Spanish! Contact us!